pitpass - Scandal or Farce? It is possible that we are on the verge of one the the biggest scandals to have ever hit Formula One, or one of the greatest farces. The FIA has overruled the clean bill of health its own Stewards gave to BAR following a six hour inspection after the San Marino GP and an appeal is set for Wednesday, 4th May, immediately before the Spanish GP. The fact that the FIA has overruled its own Stewards suggests that it believes it has evidence which overrides the best information that the Steward's had to hand. That can only mean that it has documentation which is independent of the car which was examined at Imola. Pending the hearing, Jenson Button's BAR Honda has been dropped from the results of the race at Imola for being underweight. During post race scrutineering, BAR was able to produce data which convinced the Stewards that the car ran legally during the race. 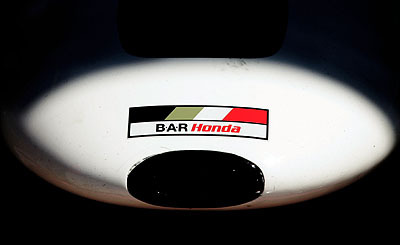 It is alleged that the BAR had a secret fuel tank and, a theory goes, it ran underweight during the race. During its final stop, so goes this theory, the car took on enough fuel to complete the race plus extra litres which became ballast to bring the car up to the minimum legal limit. This does not make sense to me. If there was a secret ballast tank, the car would not be underweight. Cars can be weighed at any time during a Grand Prix weekend and in Charlie Whiting, the Technical Delegate, we have a poacher turned gamekeeper. Charlie knows about scams, he spent ten years at Brabham when Bernie ran the team. Brabhams sometimes ran underweight during qualifying and then the heavyweight body panels would be substituted for the trip to the scales. Every car on the grid at a modern GP is weighed after qualifying so we know they start a race in legal trim. Where on earth do you put a rogue tank on a Formula One car? The pipes would give it away. Three very experienced Stewards went over the car for six hours and they found nothing wrong. Here is a question: is it usual for stewards to spend six hours examining a car which was weighed after the race and found to be legal? To the outsider it might appear that they were told to find something and, when they found nothing, the FIA overruled them. The obvious place to put a secondary fuel tank is inside the main bag tank and the rules say there can only be a single bag. Why would one wish to add a secondary tank? One reason might be ensure that the fuel that goes to the engine has no contact with air. I do not believe that there is any rule which forbids a designer from ensuring that only pure fuel, without the possibility of air bubbles, reaches the engine. When you have ten cylinders, each going bang 160 times a second, such details can be critical. We have heard that some engineers suspect that BAR ran underweight last season. We know of one who believed the car was underweight at Imola, and he expressed that opinion before the scrutineering was over but the scrutineers pass the car. It is possible there has long been suspicions about the BAR and the matter only came up at Imola because it was the first time in 2005 that one has finished. The classic scam used to be to run well in a race to impress potential sponsors and then fail to finish so the car escaped scrutineering. Why would the matter arise in 2005 when some engineers allege that the team had cheated in 2004? One purely pragmatic reason is that when an engineer moves from team A to team B, he takes some of A's information to B. This happens all the time which is why senior engineers are put on gardening leave towards the end of their contracts so they cannot take the very latest information to another team. The fact is, however, that the easy movement between teams, particularly in England, generally acts as a check against cheating. You can move between Renault, Red Bull, Jordan, BAR and Williams without moving house or changing the schools of your children, geography encourages movement between teams. The fact that personnel can, and do, move helps to keep everyone honest. Formula One is so tightly regulated that cheating is very difficult indeed. As far back as 1994, software investigators discovered an illegal traction control program hidden on the software of a Benetton. The software police have been pretty sharp. An illegal tank fitted to a car involves too many people to sound right to me. It involves fabricators, for a start, and assembly mechanics, it is not a secret shared by a handful of senior engineers earning huge salaries. It involves lots of ordinary guys who probably use the same pubs as mates from other teams. After a few beers on a Saturday night what scam is going to remain secret? We will probably not learn until BAR's appeal what the FIA believes it knows, they are playing their cards close to their chest. The question is what do they know? Apparently they believe they know more then three senior scrutineers could discover in six hours. Naturally, the conspiracy theorists have been having a field day, pointing out that BAR Honda is one of the seven teams threatening to go to the GPWC. Have I been missing something, or is disqualifying a car the usual way to keep a team on your side? There is a precedent for ballast added during a fuel stop. In 1984, Tyrrell ran underweight in races and at the final stop not only fuel went in, but also lead shot. That much is clear and it was an ingenious interpretation of the rules Tyrrell was the only team using a normally aspirated engine. The FIA banned Tyrrell, from just before the British GP, for the rest of the year and stripped the team of all the points it had gained during 1984. The reason was not because of the lead shot, but because the FIA discovered illegal elements in Tyrrell's fuel. a) Ken had been the voice of FOCA, and had been the one to slap in protests. b) The FIA was embarrassed by having an all turbo grid, except for Tyrrell, it wanted the major manufacturers. c) The FIA could not think of any way to nail Tyrrell over the lead shot. One other thing, Ken Tyrrell could not have pulled the scam today because the scales would have caught him out. In the present case involving BAR, I am sitting on the fence. I cannot see what BAR Honda has to gain from cheating, the fractions of a second on the track have to be weighed against the sanctions and the game is not worth the candle. Too many people have to be involved if the story about a hidden, illegal, tank is true. On the other hand, it is not just that Max Mosley is very bright, he is surrounded by some very bright and experienced people. If he is provoking a showdown, and overruling FIA Stewards is nothing if not provocation, he must believe he has a winning hand. He must believe that he has evidence that six hours of inspection could not find. If Max lays down a full house, then he is obliged to ban BAR from the season. He has told me so in a formal interview, I quote, "We demonstrated with the Toyota rally team that if we come across anything that is clearly designed to subvert the rules, then we will suspend the team." If Honda has something 'clearly designed to subvert the rules' I have Max's assurance that the FIA will suspend the team, though he didn't say for how long. The context of the statement, which he approved before publication, suggests a full season's suspension as was meted out to the Toyota WRC team. That would mean that some teams would have to run three cars in order for there to be 20 on the grid, as per contract. I wouldn't mind seeing de la Rosa or Wurz again, or Pizzonia but, boy, would there be ructions. If Max is going into the appeal process with a weak hand, it could be a huge farce. At Imola, we watched one of the most exciting races in years with Schumacher and Alonso putting in different drives, but both great drives. We saw the dynamicism of Michael on top form and the calm response of Fernando which, under the circumstances, was equally impressive. We were still bathing in the glow of that when we heard of Jenson's disqualification. What a way to run a railroad. The bottom line is that the FIA has overruled its own Stewards and has forced a confrontation, However way it is resolved, it is unlikely to be good for the sport. We will know on 4th May whether it is scandal or farce. In the meantime, replay the San Marino GP and remind yourself what Formula One is really about.